I ordered this pen with much anticipation, but during the wait, noticed a few negative experiences with the omniflex nib expressed online. I must admit I was dreading what my experience would be when the pen turned up and hoped I hadn't wasted my money. Anyhow, the pen arrived and I fell in love with it the first moment I saw it. The Cracked Ice finish is so very attractive. The packaging was gorgeous too, I'm not a packaging kind of person, and would normally much rather a quality product as I throw the packaging away but in this case I will definitely keep the box. I feel like I've really treated myself to something special. My Falcon was more expensive granted but the looks, feel and presentation paled in comparison. Onto the writing experience. To avoid any hard starts etc and then some overflexing by myself as a result, my shiny nib was pulled straight out of it's housing and doused in boiling water to clean off any residue. I lined it up with the feed and put it back into the pen and loaded it up with Noodler's Apache Sunset. I thought if I'm going to test out a flex pen I may as well use a shading ink. I picked this pen up at 7am and have been writing non stop with it for 3 1/2 hours and am glad to say, I'm so impressed with it. The other flexi nibs I own are on the Ahab, Nib Creaper and Pilot Falcon and this has definitely gone to the top of the list. It has to be the easiest to flex by a fair bit and I find it returns to it's thinner state quicker than the Noodlers Pens, meaning the line width within one stroke is so much more variable. I was mindful to not overflex it, so didn't push it further than I thought it could go, and that made for some serious variation anyway so I'm really pleased with the nib as it is. No hard starts, no rail roading. The feed kept up with everything I threw at it. I can't compare it to any vintage nibs, as I haven't tried any as yet, but as a modern alternative and albeit relatively affordable, surely this has got to be a good way of doing it. 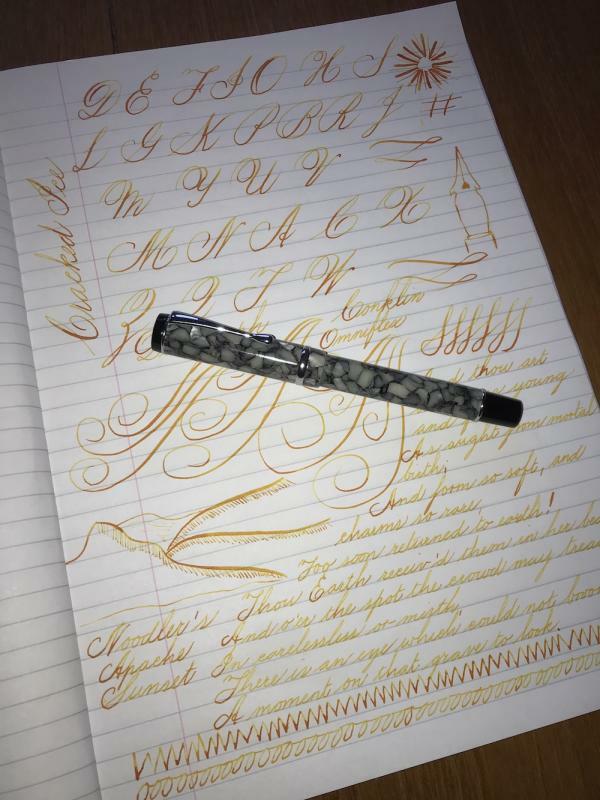 I'm really impressed with Conklin, and the pen itself. My next purchase will be the same pen in another colour with a different nib. For balance in this review, the only negative I have is that where my fingers hold the grip, I unfortunately seem to untighten the section and barrel while writing. This may not be the case for everyone, and could very well be unique to my hand shape and pen hold. If I have any issues later on down the line I will update this thread. Congrats. I wonder if they improved the nibs since the first ones came out. The one mine was shipped with was bad but it's replacement nib was better but still some flow issues. It could be they are finally doing them right. Good to hear that they have improved their nibs. They were really bad a while ago. I ended up replacing all my previous Conklin nibs with Jowo . Recently I purchased a Duragraph with a stub nib. I usually end up having to tweak most stub nibs i’ve Bought. Not this one. Smooth as silk. Great ink flow no issues with the nib at all.